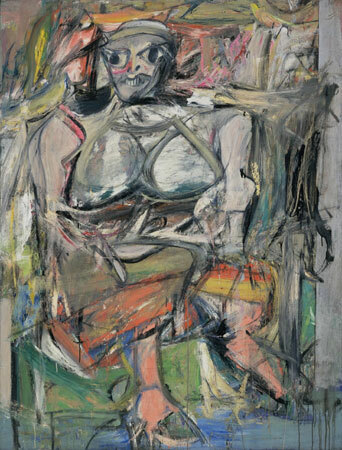 The painting above is "I, Women" by De Kooning. The medium used for the painting is oil on canvas. It was painted in 1952. I personally do not like this painting at all. The color scheme is somewhat intriguing. However the women in the picture appears to me as a monster rather then a women. The only reason you can tell it is in fact a women is by the prominent breasts shown in the picture. I do not find this picture pleasing to look at and is by far one of the least flattering pictures i have seen all year.